There are fads in fashion, music, as well as in video games and few flashes in the pan shined as brightly, or burned out as quickly, as the peripheral-based music game crazed that shook console gaming in the late 2000s. Games such as Guitar Hero and Rock Band were cultural milestones for their time, spawning a legion of clones and even an inspiring an entire episode of South Park (spoiler: their assessment of these types of games was less than positive). The main feature that ties these two games together is that both are ostensibly timed button press games combined with peripherals that simulate some kind of musical instrument, whether it be a guitar, keyboard, and, later, even microphones. Another draw of both of these games is that each would boast of massive libraries of classics and even a few obscure tracks for players to listen to while they jammed out on imaginary instruments. Not only did this stellar soundtrack help solidify each game as a go-to party gaming experience but also broadened the audience for the game beyond that of traditional video gamers, bringing in people of all ages. The Guitar Hero peripheral-based music games also preceded the motion-control craze swept in on the industry by the advent of the Nintendo Wii so you could make a tenuous argument that games like Rock and and Guitar Hero helped pave the way for that revolution. As each series matured they began to differentiate themselves through different themes and celebrity endorsements of their respective products. The core gameplay between each remains similar. In terms of differentiation the most obvious difference between Guitar Hero and Rock Band is in the instruments on which they focus. Guitar Hero largely started out as a guitar-focused game with other instruments added later. This guitar-focus differentiated the kinds of songs you would get with Guitar Hero from those that you would hear on Rock Band, with the latter having a more mainstream appeal. 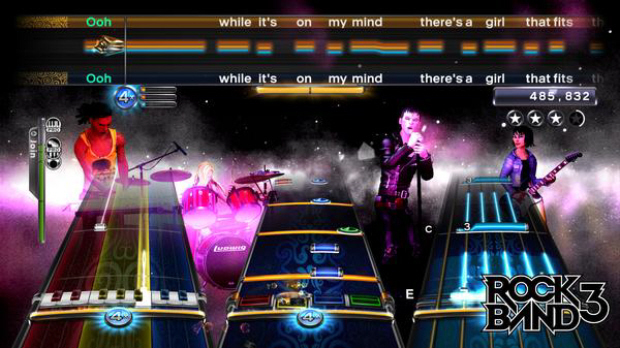 Interestingly, both Guitar Hero and Rock Band show the influence of developer Harmonix, who has had input on both series. Both series can be accused of peripheral overload but this was a tradition largely started by Rock Band and later adopted by the Guitar Hero series. While it was a cool idea to expand the scope of the game and making it a more multiplayer experience, it also became an increasingly confused type of game with Rock Band largely leading the way in this development. It seems like Guitar Hero’s loss of focus on playing a guitar helped lead the series to its irrelevance. That said, it is a sin that both series are guilty of and it doesn’t really help to point out the waves of plastic that accompanied each release. Another development that probably undermined each game and ultimately relegated the whole genre to the history books was their ubiquity and iterative frequency. You couldn’t escape a music game if tried during the height of Guitar Hero and Rock Band’s popularity. On every system from the Sony PlayStation 2 to the Nintendo DS, the prevalence of each title probably did not help maintain relevance. The varying quality between the various iterations also did little to lend the game to a strong base. And then there’s the number of games that were coming out. You would be hard pressed to find any series that was putting out games as frequently as the Guitar Hero and Rock Band games, with with six games in the Guitar Hero series and seven in the Rock Band series. Let’s keep in mind that the first game in the Guitar Hero series came out in 2005 and the last game in the Guitar Hero series being Guitar Hero Live dropping in 2015. That’s thirteen games in a decade – people were getting a little burnt out by that time. One factor that contributed to the downfall of each series that is completely out of their control is the late 2000s financial crisis. Not only did this event wipe out billions in value in companies across multiple sectors but also greatly impacted the average consumer’s ability to spend money on things like video games. A classic story, we all know about how much companies love money and once the gilt fell off the peripheral-based music game lilly, they cashed out their chips and left the genre in the dust. Attempted reboots since haven’t really caught on and the genre itself is largely popular today on Apple iOS and Google Android smartphones and tablets. So where does that bring us in terms of what impact the two series had on music games in particular and video games in a wider sense? Well, music games were around before Guitar Hero and Rock Band and they are still thriving after those games have passed into irrelevance. Again, the dynamic of playing these games mainly on a smartphone has hampered the ability of console-based games to be relevant but that doesn’t mean there isn’t a future for the brands. Where the rub lies is in their peripherals. This is now seen as a relic of a time now long gone. But what is Guitar Hero or Rock Band without the peripherals? What can these games do that is unique or different than a standard rhythm game if they aren’t incorporating peripherals into the experience? We don’t see peripherals coming back into vogue any time soon but you can beat your dollar that Guitar Hero and Rock Band will be at the forefront of the resurgence. What game is better than the other or which game had a greater impact? While it is somewhat unfair to compare the two, especially given their shared Harmonix lineage and initially different focuses, we have to say that Guitar Hero, in terms of gaming history, had a greater impact on video games than Rock Band ever did. 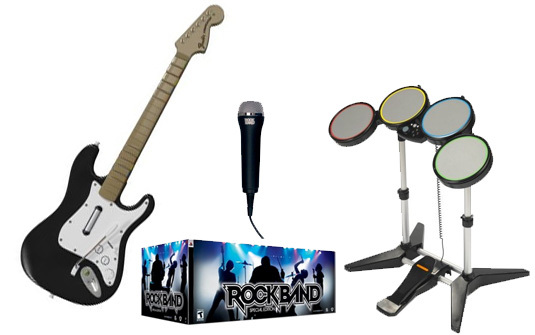 Though we would not call Rock Band a derivative product since it offered a unique experience, the argument could be easily made. Guitar Hero, however, introduced the genre and for that reason it is the go-to game in this category. Previous PostThe Top 10 Underrated Game Boy Advance Games Next PostBattletoads (NES) - Think You Can Beat It?